The web series Comedians in Cars Getting Coffee is showing no signs of slowing down in Season 7, which kicked off with a very special guest joining star/creator Jerry Seinfeld last month, U.S. President Barack Obama. This season's fourth episode of Comedians in Cars Getting Coffee will debut Wednesday, January 20, and Crackle has released a new trailer for this episode, revealing that Jerry Seinfeld returns to the set of Seinfeld for the first time. The comedian is joined by special guest star Garry Shandling in this episode. 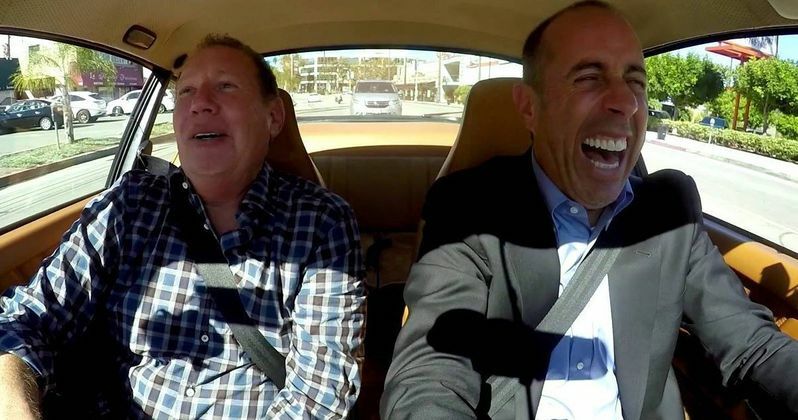 This week on Comedians in Cars Getting Coffee, Jerry Seinfeld returns to the set of Seinfeld for the first time ever with his friend and fellow comedian Garry Shandling. In the all-new episode, launching Wednesday, January 20 starting at 11:30pm ET on Crackle, Seinfeld and Shandling drive around in a Cashmere Beige 1979 Porsche 930 Turbo, reminiscing about their start in the 70s at The Comedy Store on the infamous Sunset Strip and the days of shooting their respective hit shows directly across the street from one another. The duo stop by CBS Studio Center in Los Angeles to take a walk down memory lane on the New York City street set that was built for Seinfeld. The seventh season of Comedians in Cars Getting Coffee is comprised of six episodes, with a new episode streaming every Wednesday night at 11:30PM ET. Other Season 7 guests include President Barack Obama, Will Ferrell, Steve Martin, Kathleen Madigan and Sebastian Maniscalco. Most recently, Comedians in Cars Getting Coffee was nominated for a PGA Award in the "Outstanding Digital Series" category. Sponsored by Acura, the series is executive produced by Jerry Seinfeld and Sony Picture's Televisions Embassy Row. Back in April 2014, Crackle renewed this hit web series for four additional six-episode seasons, through the show's ninth season. The show typically airs two six-episode seasons per year, but it isn't known when Comedians in Cars Getting Coffee Season 8 will debut quite yet. We'll be sure to keep you posted with any updates on this beloved comedy series. Since its debut in July 2012, Comedians in Cars Getting Coffee has delivered more than 40 million streams, garnered rave reviews, and earned Jerry Seinfeld a Primetime Emmy nomination in the Outstanding Special Class - Short-Format Nonfiction Programs category and two recent 2014 Webby Awards for Best Individual Performance (both the Webby and the People's Voice Award). Additional accolades include a Bronze Telly Award in 2014 for Branded Content with Acura; a 2014 Webby Media and Entertainment Honoree and Branded Content Honoree for Interactive Advertising and Media; and a special Webby Award in 2013 for Outstanding Comedic Performance. Take a look at the preview for this week's episode of Comedians in Cars Getting Coffee below.